Update: To you people searching for some variation of ’80s snowboarding, I have one question for you. Why?! Thanks to you I’ve been getting a ton of hits on this post, but please let me know why you’re searching for information on ’80s snowboarding in the first place. 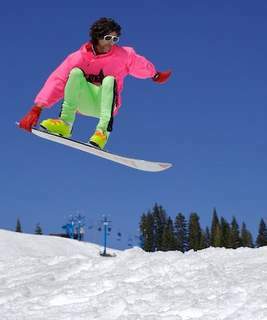 I can only hope the snowboarding fashion pendulum is not swinging back towards the ’80s. If so, I just might quit riding. Just so you know, this post has almost nothing to do with ’80s snowboarding. And hey, thanks for visiting. Stay awhile. There’s plenty of other good stuff here. Word. Traveling and snowboarding is easy. You basically have one of two options. One: Rent gear at the mountain. Or two: Fly with a board bag. Let’s examine the pros and cons of each option. Renting gear has become an increasingly sure bet, as most shops are now stocked with modern, well-tuned equipment. Chances are highly unlikely you’ll be riding gear from the ’80s. Check with the rental shop first to find out what kind of gear they use, the shape that it’s in, and what decade it’s from. Many shops can tell you this information online. The significant advantage of renting gear is not having to hassle with an oversized board bag, which ultimately means you’ll avoid additional baggage fees. You head to the mountain, you hit up the shop, you’re on the hill. No lugging around gear. No watching out the window in horror as the ground crew rolls over your equipment. No waiting in line for baggage. As an added incentive, some shops even offer a discount if you reserve your gear a few days beforehand. And if you’re feeling especially lazy, you can have gear delivered to your lodge. Flying with your own gear can be equally convenient. Your boots and helmet fit properly. Your bindings won’t burst to pieces on a gnarly descent (you hope). And you’re familiar with your own board. No standing in line at the rental shop. No sizing issues. No fear of sticking your foot into a boot that smells like a dead animal. The downside, of course, is that most airlines will hit you with a baggage fee. And some airline fees are just downright ridiculous. Some, like those at Southwest, are free if your board bag is the only bag you’re checking. Personally, I go with the board bag option. I’m able to fit all of my gear plus clothes in my bag. I’m slightly particular about my gear, and for me, it’s satisfying to know what I’ll be riding for the weekend. If I’m forced to pay an extra $20, $30 to the airline each way for this added comfort, then so be it. Shall we do a minor price comparison? 1. Southwest: One snowboard and one pair of boots encased in a container acceptable to the carrier may be checked in substitution of one piece of the free checked baggage allowance for each passenger at no charge on a one-item-for-one-bag basis. If the item of sporting equipment exceeds 50 pounds in weight or 62″ in size (outside length plus height plus width), excess weight and size charges may apply. 2. AirTran: For all coach class reservations, the charge for a first checked bag is $20 with size and weight limitations. Some sporting equipment fees are assessed separately. Snowboarding equipment must be in a specially designed case with a Limited Release Tag. There is a $69 overweight fee if your gear is over 70 pounds. 3. Alaska Airlines: $20 for a “regular traveler’s” first checked bag. Snowboarding equipment may exceed the size allowance (not to exceed 115″) without incurring an oversize fee. A standard checked baggage service charge and overweight fee (51-100 pounds) apply for each piece checked. 1. Bear Mountain: $30 per day includes board, boots and a helmet. 2. Breckenridge: Breckenridge Sports offers an assortment of rental options, from a basic Alpine Sport Package for $31.20, to an Alpine Delivery Rental Demo Package for $296.80. Save 20% when you rent online. 3. Jackson Hole: $37.50 per day for the Performance Board Package. Receive a 20% discount for pre-booking. So really, it all comes down to preference. Try calling other shops around town. They might have competitive prices. You can also ship your gear to the mountain, but I can’t say for certain if this would be the most cost-effective decision.